Loaf Mountain is a fairly gentle peak located in the southern Bighorn Mountains just 4 miles north of Powder River Pass (US Highway 14). Due to the proximity of this paved highway, it's an accessible objective and makes for a fairly easy day hike. 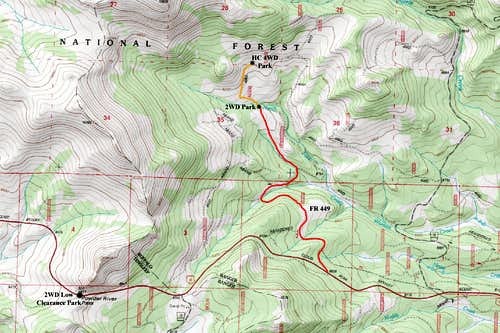 The normal route is 3 miles each way and gain about 2,800 feet. Be prepared for wind and lots of talus if planning to venture here in the summer, and extreme wind and snow any other time of year. The nearest town is Tensleep, Wyoming located 29 miles west of Powder River Pass on Highway 14. The town of Buffalo, which is larger and has more amenities is 35 miles east. From either town you can drive to the pass easily unless the road is closed (which is common in the winter). If you have a passenger car with good ground clearance, or a 4WD vehicle, the best place to start the hike is on the north end of the FR 449/FR 447 loop. Drive 2.6 miles east from the top of Powder River Pass and turn sharply left onto Forest Road 449. Follow this narrow, rocky road for 3 miles to the furthest north point just before the road turns east. Park off the road here. Two wheel drive passenger cars with good clearance will have to stop half a mile before this point due to a stream crossing with a large dip, then walk the last half mile. If you only have a normal, low clearance passenger car, it's best to park at Powder River Pass. See map below. 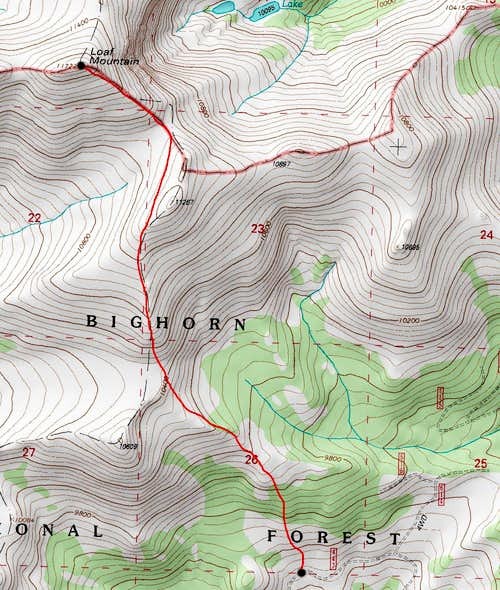 If you are able to utilize FR 449, drive or walk to the north end of the loop, then leave the road and hike through open trees in a NNW direction 800 feet up and reach the crest of a small east-west oriented ridge at 10,000 feet. Walk this ridge west a few minutes, then cross a large meadow northwestward and hit the 10,460 foot saddle just north of point 10,600. Continue hiking north up large boulders near the ridge crest, staying just left (west) of the small humps of rocks. At 11,120, leave the ridge and make a very gradual descending traverse to the broad 11,060 foot saddle between Loaf Mountain and Point 11,260. This allows you to bypass Point 11,260 on the left (west) side. From this broad saddle, its an additional 650 feet to the summit over the course of a half mile on huge boulders. The going would be fairly slow for anyone not comfortable boulder hopping on car sized rocks. If you have a low clearance car, it's best to park at Powder River Pass and hike the long ridge north going over, or around Points 10,200 (immediately north of the pass), 10,500, and 10,600 (immediately south of the 10,460 foot saddle), at which point you meet up with the normal route. This adds something like 1.5 miles each way. Camping is allowed anywhere in this area, although it wouldn't make much sense to camp on route as it's a fairly easy day hike. There are numerous campgrounds along Highway 14, all of which charge a fee. For the best camping just pull out onto any of the FR roads and pitch your tent. No red tape! Any time of year. Just be prepared for harsh winds at all times. Winter will be brutal.